myHermes provides affordable delivery solutions for businesses and private customers throughout the UK. Part of the Hermes Group, the company offers two-day delivery service through its nationwide network of myHermes ParcelShop outlets. It also offers three-day delivery with doorstep collection using a nationwide network of independent couriers. All parcels sent with myHermes are tracked. Each parcel is assigned a 16 digit parcel number. This number may be entered in the ‘Track a Parcel’ tool found on the top right hand corner of the myHermes homepage. The parcel number is found on the order confirmation emailed to the sender or by logging into a myHermes account and clicking on ‘Your Shipments’ at the top right hand corner of the screen. myHermes is not able to directly provide information on the location of a parcel that has been sent on behalf of a High Street retailer. The company is contractually unable to provide this type of information. In order to track these types of parcels, customers should contact the retailer directly and provide the details included in the order confirmation from the retailer. Costumers are encouraged to allow up to five working days for a parcel to be delivered to a standard UK address. For remote areas such as the Scottish Highlands, the Islands of Scotland, the Isle of Man and the Isle of White, customers should allow for seven working days for delivery. myHermes provides delivery and collection services to members of the public as well as small and medium sized enterprises. Launched in 2009, the delivery service offers doorstep collection through a network of local couriers that are self-employed. In 2012, the company opened its first ParcelShop locations. As of 2014, the company operates more than 3,000 myHermes ParcelShops across the UK. The first of the company’s Parcel Lockers were launched in 2013, allowing for 24-hour drop-off of parcels sent with myHermes. myHermes is owned by Hermes UK, which also operates an independent courier network. Hermes UK delivers over 190 million parcels each year for some of the UK’s largest online retailers. Hermes UK provides services to Arcadia Group, ASDA, ASOS, Debenhams, JD Williams John Lewis, Next Directory, QVC, Tesco and others. 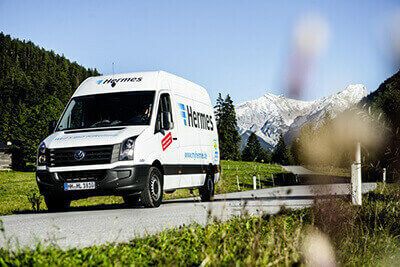 Hermes UK is owned by Hermes Logistik Gruppe Deutschland (HLGD), which is the largest independent home delivery service in Germany. Serving business-to-consumer and consumer-to-consumer clients, HLGD operates 14,000 ParcelShops in Germany and is one of Europe’s largest parcel shipment services. Hermes UK is part of the Hermes Group, which includes companies active in a range of business areas. Subsidiaries are found around the world, including Russia, Italy and Germany. The Hermes Group includes sourcing and product subsidiaries Hermes-OTTO International and Hermes Hansecontrol Group, transport logistics subsidiary Hermes Transport Logistics, e-commerce companies Hermes Fulfilment and Hermes NexTec, and distribution subsidiaries Hermes Logistik Gruppe Deutschland GmbH, Hermes UK, Hermes Italia, Hermes-Logistik GmbH & Co KG, and Hermes-DPD . More information about the Hermes Group is available at www.hermesworld.com. myHermes offers door-to-door courier services with delivery to anywhere in the UK within three working days. Delivery may take up to five days for destinations in outlying areas of the UK. A network of approximately 9,500 local couriers pick up parcels directly from a home or business, as well as a designated safe place such as a neighbour’s home or a nominated location on a property such as a porch or shed. Courier prices depend on the weight of a parcel. For delivery of parcels up to one kilogram within the UK, prices start at £2.98 including VAT as of August 2014. Prices range up to £9.98 including VAT for parcels weighting between 10 and 15 kilograms. A surcharge of £2.00 including VAT applies for remote area delivery, including destinations in Isle of Man, the Shetland Islands and the Outer Hebrides. For signature on delivery, a surcharge of £1.00 including VAT applies. Collection may be arranged up to seven days in advance. When an order is placed before 10 p.m., customers have the option to choose next day doorstep collection of their parcel. In order to use myHermes’ courier service, customers must print off a shipping label and affix it to their packaged parcel. Collection is between 8 a.m. and 8 p.m.
myHermes operates an online tool to send parcels. Customers simply enter the weight of their parcel along with the origin and destination post code. Based on this information, the tool automatically generates a quote for sending the parcel through courier collection or by dropping it off at a ParcelShop or Parcel Locker. Customers can then selected their delivery preference, along with any additional services such as signature on delivery or enhanced compensation cover. To obtain a quote for sending a parcel, purchase a shipping label or arrange courier collection, visit www.myhermes.co.uk/send-a-parcel. In order to purchase a shipping label or arrange courier collection online, customers must register with myHermes. Registration is free and may be completed online or when purchasing a shipping label. ParcelShops are situated in urban centres throughtout the UK. Locations generally operate with extended hours, meaning customers may drop off parcels early in the morning or in the evening. Parcels dropped off at a ParcelShop location are typically delivered within two working days. Delivery times may be longer for parcels sent to remote areas of the UK. Customers are able to get a quote for their parcel and print off labels at a ParcelShop location, as well as drop off parcels when a label has been printed online. ParcelShop prices start at £2.78 including VAT for parcels weighting up to one kilogram, as of August 2014. Prices vary depending on the weight of the parcel, with rates up to £9.78 including VAT for parcels weighting between 10 and 15 kilograms. A surcharge of £1.00 including VAT applies for delivery of parcels in outlying areas of the UK, including the Isle of Man, the Shetland Islands and the Outer Hebrides. Signature on delivery is available for £1.00 including VAT. To find a ParcelShop, visit the myHermesParcel Shop Finder. myHermes has a range of delivery services including in-store drop-off, door-to-door couriers and drop-off lockers. Any parcel sent with myHermes must be less than 120 centimetres on any side and a maximum combined length and circumference of 225 centimetres. The parcel must also be less than 15 kilograms. Parcels sent with myHermes may be dropped off at safe and secure lockers located throughout the UK. Parcels left in a locker will generally be delivered within two working days. Delivery times may be up to five days if a parcel is sent to outlying areas of the UK. In order to send a parcel using a locker, customers must print shipping labels at home or work. Parcel Lockers operate 24 hours a day and seven days a week. There are more than 100 lockers located in the UK, often in local supermarkets, shopping centres and petrol stations. Prior to dropping off parcels at a locker, customers must get a quote for shipping their parcel and print their shipping label online at www.myhermes.co.uk. When using a locker, customers simply scan the barcode on the parcel’s shipping label. This will trigger the locker door to open. Lockers are available in a variety of sizes to accommodate parcels with larger dimensions. Each item must be individually scanned when dropping off multiple parcels. The maximum parcel size for a locker is 34 by 43 by 66 centimetres. Customers may only drop off up to five parcels at a time. myHermes offers compensation for damages and Signature on Delivery on all parcels sent through its network. The delivery service also provides a range of convenient solutions for retailers, online shopping customers and businesses. myHermes offers compensation for damages including enhanced coverage on parcels sent through its system. All parcels are covered for up to £50 free of charge. Additional coverage up to £100 may be purchased for £1.20 including VAT and up to £250 for £2.40 including VAT. Signature on delivery is automatically added to the final cost when additional coverage is purchased. Signature on delivery is available for an additional fee when sending a parcel with myHermes. When this option is selected, the parcel will only be delivered to the destination household or a neighbour. A signature will be obtained at the time of delivery from the person who accepts the parcel. When purchasing the signature on delivery option, customers will be given a tracking number as normal that can then be provided to the recipient. myHermes provides a fully-tracked returns service for many UK retailers. In order to return a parcel, customers visit returns.myhermes.co.uk and select a retailer before registering or logging into their myHermes account. Customers then select a preferred delivery method and enter payment details. Once a shipping label has been printed and affixed to a parcel, it can be dropped off at a ParcelShop or collected by a courier. Businesses may register for a dedicated account with myHermes. myHermes provides a range of services for businesses of all sizes, including Amazon and eBay shipping integration. This integrated system allows users to automatically import orders from Amazon and eBay accounts to a myHermes account. All orders will be visible online on the ‘Your Shipment’ page once a customer is logged into their myHermes account. Other services provided to businesses include CSV file uploads to myHermes accounts, a structure shipments page and thermal label printing. For businesses that ship more than 100 parcels per day, myHermes also offers flexible van collections, a dedicated customer service team and invoicing. For more information about business accounts with myHermes, email sales@myhermes.co.uk. myHermes will not delivery certain items, including any item that may be harmful or illegal. Examples of items that will not be shipped include drugs, weapons, explosives batteries, sharp instruments, perfumes and aftershaves, paint, vehicle parts, filth, and dangerous goods including flammable and toxic items. Live animals will also not be shipped. Certain items are excluded from compensation if they are damaged while in transit. Items excluded from compensation include poorly packaged items or items that are strapped together. Other excluded items include antiques, glass, liquids, furniture, china, musical instruments, electrical items, jewellery and watches, and negotiable documents such as passports. A full list of items that are excluded from compensation for damage and items that myHermes does not ship is available online. In most cases, couriers will leave a contact number with the calling card. Parcel recipients may use this number contact the courier in order to reschedule a delivery at no additional charge. If a parcel recipient is not available, a courier may also leave a parcel in a safe place. A safe place will be a dry and secure location on the recipient’s property. This location may be nominated at the time the parcel is sent. Examples of a safe place include a shed, porch or greenhouse. If a parcel is left at the property, the calling card will include clear instructions stating where the parcel was left. If the status of a parcel indicated that it was delivered and no calling card was provided with information on its location, or if the instructions are not clear, recipients should contact the courier if a contact number was provided. All couriers are self-employed. As such, they are not obliged to leave a contact number. myHermes also does not provide contact information for their couriers. If a courier has not left a contact number, customers should contact myHermes directly for information about the location of their parcel. All myHermes couriers are self-employed and independent couriers that provide services to Hermes UK. In order to be a courier, individuals must be available to provide courier service at least six days per week from Monday to Saturday. They must also have a secure area for parcel storage at their home or business and own a vehicle that will be used for deliveries. Hermes automatically provides insurance on a third party basis for the use of the vehicle to collect and deliver parcels and/or catalogues on behalf of Hermes. To apply as an independent courier and for more information, visit hermes-europe.force.com/recruitment. In addition to courier opportunities with myHermes, there are a range of job and career opportunities with Hermes UK. Hermes is divided into six business areas, including sales and marketing, finance, Information Systems (IS), change management, operations, and human resources. Various positions related to a broad range of specialties, including learning and development, payroll, health and safety, field management, business analysis, project and programme management, IT planning and services, legal, procurement, client management, and customer services. Businesses can partner with myHermes and become a ParcelShop. As a partner, businesses will have no financial expense and are paid per parcel that is sent through the ParcelShop. Businesses are provided with all the necessary equipment and full installation of point of sale (POS) equipment. Training is also provided and regular field visits help partners develop their ParcelShop business. Parcels are collected daily by myHermes couriers from ParcelShop locations. myHermes may be contacted by phone, email or webchat. To contact myHermes by email, complete the online enquiry form. To contact myHermes by phone, call 0330 333 6556. The registered address for myHermes is Hermes Parcelnet Ltd., Capitol House, 1 Capitol Close, Morley, LS27 0WH. How do I find if my parcel has been delivered. I have courier slip qvc have agreed parcel has been picked up but not received by them. Why ??? I have been trying to track a parcel from Aei products, so far it appears that you company has it,can you possibly let me know when it will be delivered to me. I have been told that a parcel from THANE is with your company but it isn’t recognized by the tracking number given. I was told you received it on 16thJanuary. Trying to get parcel collected which has been paid for. Several days have elapsed and two collection days booked and no collection made. What do you have to do to get a collection after pre-paying? trying to track my package, (expecting delivery.) All I get from the tracking system is; There are currently no information for the entered tracking number available. Please check the entered tracking number for typos or try again later. Contacted vendor, still awaiting reply. Why can I not phone M H ? Could they not track it from my delivery address/ post code? I am trying to trace my order which I paid extra to have delivered Tuesday 15th November. No card was left and entrance buzzer was not used by Hermes driver. I received that day as part of my order a package from parcelpost. the courier has called three times when I have been out, I called her and she said she couldn’t come at any other time and couldn’t hold the parcel until tomorrow when I would be in (Thursday 13th October). How can I get my parcel? I am writing to find out why your drivers have lied to you and said they tried to deliver to my address at 16:45 hrs on the 29/09/2016 when I was at my property all day and nobody knocked on my door. I have been told that the parcel is going to be tried to be delivered today. the parcel is from American golf to ng17 4ee number 63. can you please supply tracking code so I can track the order myself. I have also got cctv on the front of my house. I am not very happy with your service you provide as I am unable to track the delivery of a parcel containing my husbands boots sent by a company called BrandAlley. The tracking number they gave me was 1001371983228085 when they advised me that the item had been despatched, but I have been unable to track the parcel on your system to find out if it is to be delivered today. I would be much obliged If somebody would look into this for me and advise. Thanks and kind regards, Linda Boyland. Hi! I have a parcel with the reference number:8721075807633371. I noticed that courier has tried to deliver at 12:26 today, but I was not in my flat at that moment. So could you ask the courier to deliver it now or before 8:30 tomorrow morning? Because I will have class tomorrow until 2:00 pm. If the courier try to deliver tomorrow, could he come after 3:00 tomorrow afternoon? Thank you very much! receipt shop is P4495581. BUT it does not match. the parcel was as destination the SMARTBUY GLASSES . I recently purchased an item of E-Bay with tracking number 8823571252554089.I have not received item although it states it was left at my address in a secure place .There has been no calling cards to guide me to where the item was left.I would like confirmation from you to where it was left and if left was this a secure enough location.I never have this problem with Royal Mail as parcels are left down sorting office at Hastings.This could have been a valuable item in parcel and should never been left on doorstep for all to see. Hi, Can you tell me what has happened to an Ebay order with a tracking number of 8400575248409783 ? The company sending to me is http://www.uniquebirdfood.co.uk though the name on Ebay is *kendallsparrotandaviary*1. The name of the person sending is Katie Kendall. This item was shown as with courier for delivery today but was not delivered. Status now show carried forward. Please advise when you will deliver. Thank you. I have to tell you that your courier service is Rubbish!! I have had parcels lost by your couriers also even though I leave instructions when ordering to leave my goods in the garage, they are always left on my front door step, where anyone could take them!! When I asked one of your so called couriers why he didn’t follow instructions he just SHRUGGED!!! URGENT: I should of had a delivery date between 7th and 18th December, i then had notification that it would be delivered 19th December, but up to date i have not received the parcel. This is a VERY SPECIAL Father Christmas delivery. Please can somebody help me track this parcel. We could do, but we need the tracking number of myHermes. Could you please post it? Please contact me re : left parcel @ neighbours house. Tel. 07513427155 – Jane Thank you. I’m looking for an explanation of your delivery methods to my address. I ordered some things from Mountain Warehouse which were supposedly delivered by yourselves last Tuesday to my house. In reality they were dumped at a holiday home in my village. Fortunately the guests who were staying in that property contacted the owner who happened to know who I was and contacted me to go and collect my parcel. So, I was horrified to learn from Amazon that a camera that I have ordered was also scheduled to be delivered by your company. I actually contacted Amazon to warn them of my recent experience but it had already been dispatched. I received an email today informing me that it has been delivered to my house…..surprise, surprise no it hasn’t. I asked Amazon to pass on the simple information to whatever idiot is delivering for you in this area that if you can’t find a property then you phone the number provided to you. We cannot give out statements on behalf of myHermes, as we are not related to them. What we know is that there are some misunderstandings or actions taken by the driver which are made due to time issues. You need to contact myHermes directly, if you need a statement. 3841077612592056 has it gone missing? Hope that you can track it for me. Did you get the parcel by now? I checked on line about the progress of my parcel, but the latest update was with local courier. I needed to know if it was being delivered today, and if so an aprox time. I called Hermes, and got a message. “Can not discuss this item with me as it was from a retail customer. I am now stuck at my address waiting for an important parcel, which may or may not arrive.Thanks Hermes. Parcel delivered this morning just thrown over back gate in the rain !! Unable to contact Hermes directly to complain. Very poor service. I bought one item from ebay on 9th september, 2015 and Hermes co. should deliver it to me but I didn’t recieve it till now !! So pls resend my item again or call me pls to organize it.. This is my tracking no. It seems that the parcel has been delivered already. Hello, You are delivering two parcels to me and I only have the tracking number for one of them. We are not able to get tracking numbers based on addresses. This has to be done over the shipper. Sorry.